Before I start on this blog post, I would like to share some reflections. 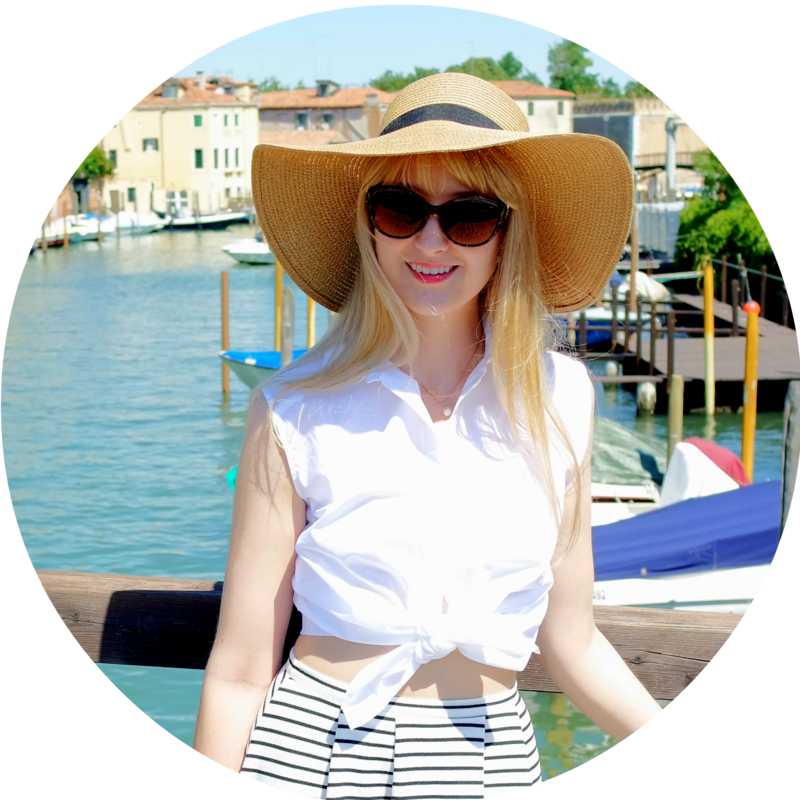 I've always been careful what I share on my blog - I talk about products, discussions about life, decorating and food, what I enjoy wearing, how to do hairstyles. Basically I don't want to tell anyone how they should look or should care for themselves, but instead offer a resource for those who want to express their own style and get recommendations from someone who is clear and honest about products. This extends to certain topics I have always refused to blog about, despite offers of advertising money sometimes - I have had very hard rules against things like recommending diets and weight loss, discussing things people "should" do to "look better", and I absolutely do not talk about cosmetic surgery, because my ethos is that however we look, if we are happy it shouldn't be shamed or questioned. I also have the belief that if there is something you're not happy about and you can change that without harming yourself or someone else, then why not do it? 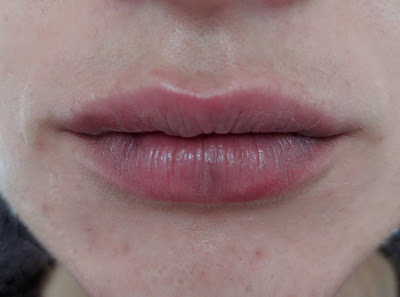 For me, I have been unhappy with my scarred lips for quite a while (my first documented moan on this blog was 2012!). I have done lots of thinking about what I could do to fix them, tried lots of products (many which I have reviewed on here) and done a lot of research into what may help them be less scarred. I got recommendations from professionals about what I could do, and I did lots of reading. 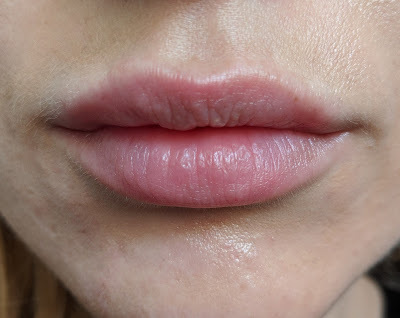 I felt there weren't many accessible and "real" reviews of lip fillers online, and those I read were often clearly sponsored by companies who make lip fillers. Therefore I wanted to share my experience of having fillers with my audience. I want to make it really clear, I don't feel this is something women SHOULD have and I don't want to shame anyone who is happy with their appearance if it looks similar to how mine was before. I want to provide a resource for those interested in fillers and who want to read my story. When I was 16 I was on Roaccutaine for acne. It's a really strong, drying medication which was a miracle for my spots. However, it caused my lips to become very dry and my entire lip would peel off once a day. It was a horrible, painful experience and left my lips really scarred. Although my lips were fine, they would play on my mind a lot. If I wasn't wearing fresh lipbalm they would become very wrinkled and I would constantly be pressing them with my teeth to get blood to go to them and plump them for a minute. 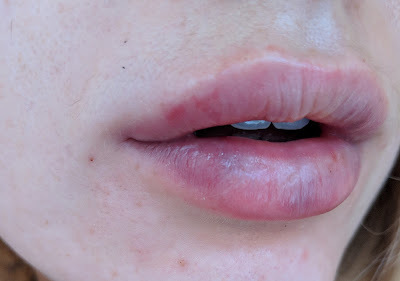 I noticed I'd be mentally not present in some conversations because I was thinking about how gross my lips were and wondering when I could next put on more balm. There were lots of lipsticks I couldn't wear because they would dry out my lips too much. I tried everything - any lip balm, drinking gallons of water, cold sore treatments, any product I could experiment with. I finally put my question on the Facebook group Mrs Gloss and The Goss and I got lots of recommendations for balms I had tried. However some people who had the same post-Roaccutaine lip problems said they had lip fillers and it cured their lip problems! I did lots of research into how to choose someone who does fillers. I understood that it had to be by a qualified nurse or doctor (not a beautician in a salon) because they could do it safely, they would be well-trained, and they could inject hyaluronidase which is the chemical that can break down filler. I started googling local companies who do dermal fillers and took this step really slowly and carefully. I would look at their websites, read their information on how trained they were, whether they were a member of the British Association of Cosmetic Nurses, and importantly I'd look at their social media to see real examples of their work. I started to notice there were clearly different "styles" that each professional had. Some did more natural looking work, others appeared to do more "celebrity" styles and duck lip shaped styles. Obviously that doesn't make a practitioner good or bad, I assume that they are doing what their clients ask for and maybe this means they attract people who inject in the style they do. I decided finally on Camilla at Shore Aesthetics who is based in Bournemouth and Northampton. I liked her work on Instagram and she had great reviews on Facebook. I booked a consultation with her which was free at the end of April. I discussed my concerns and she really listened, talking about what she would do, how she would preserve the shape but inject in different ways to ensure all the scars were pushed out. She used Restylane Kysse which is a softer version of the filler and would last 4-6 months so I could see what the filler was like before investing in a longer-lasting filler. She did a very thorough consultation checking my health and background to make sure I was suitable for fillers. We also had a good discussion about the potential complications, how they could arise, what they could be and what to consider when making my decision to have them done or not. Later in the week, I went to meet Camilla at her consulting room. She checked my health was the same as before and lay me down on the sofa. I was really nervous, but she was great at the distracting chat and reassured me. She smeared a numbing cream over my lips while she got herself ready. It was a strange sensation - I felt like I was dribbling and couldn't work out if I had my mouth open or shut! At this point we again had a conversation about the potential complications in good depth and what signs to look out for when I got home. I'm glad we had the conversation, but I must admit it was anxiety provoking - I'm the type of person that doesn't read the leaflets that come in tablets because I'm too anxious to know what might go wrong! It was also reassuring that Camilla is a nurse prescriber, so if something did go wrong she said she would prescribe the correct antibiotic or whatever it was I'd need. Camilla then used a needle to inject all around the border. She used a small vibrating T shaped tool to distract from the sensation of the needle, and helped me do breathing techniques to manage the discomfort. It wasn't painful - it was a little nip and then it was fine. I'd liken it to a little flick from an elastic band. The filler also had lidocaine in which was numbing so it felt fine after! Then she swapped the need for a long cannula. She made small incisions on the side of my mouth on the skin-coloured part and worked a cannula from the side to the middle of the lips. It wasn't painful, but felt odd - like the sensation when you pop a spot almost! Again, it was a little uncomfortable as she gently squeezed thin strands from the middle to the outside of the lips but the lidocaine kicked in quickly. The benefits of cannulas is that they reduce bruising so you can look ok straight away. After this basic procedure, Camilla took a step back and made me move my mouth around while she decided what to do next. She put the needle back on and then did some injections into the cupids bow (this was the worst part - I would liken this pain to when you have a spot on your top lip and you pop it and it makes your eyes water. It was over really quickly though. She then did surface-level injections into the remaining scars which hadn't been pushed out. This was the part that caused bruising for me, but I guess if you didn't need those injections you'd be ok. The whole procedure was done in around an hour. The procedure cost £260 for 1ml filler which I understand is about the average price. Camilla gave me a lip-shaped ice pack at the consultation which I had in the freezer. She also gave me an ice-pack as I left the filler appointment. I had to ice my lips all evening and as much as I could the next day to reduce bruising. I also had to sleep sitting a bit propped up to reduce swelling and bruising. 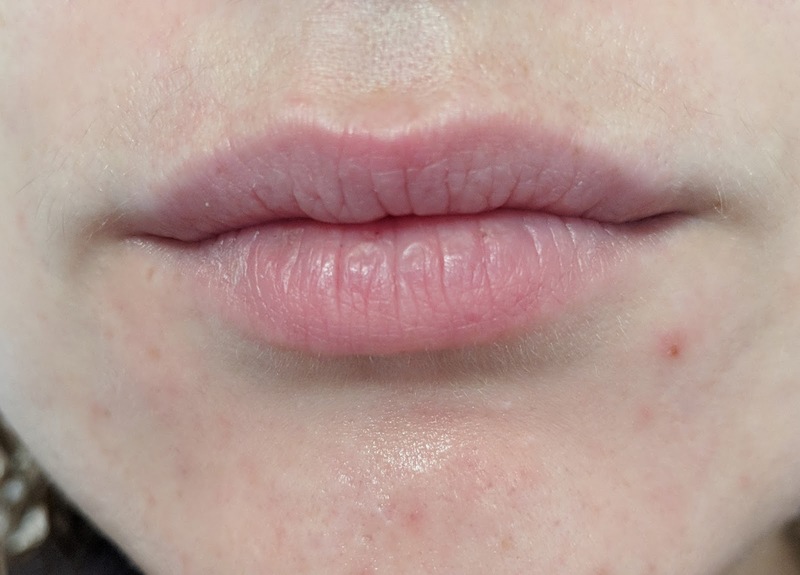 I had a bit of a worry that my lips looked a little blanched (which can be a sign there is filler in the arteries/veins which wouldn't be good). Camilla was amazing, checking in with me hourly that night, getting me to send videos and giving me information on how to manage it. She also booked me a next morning consultation to check in with me. I put a hot compress on as advised and it was all normal in the end - turns out I had a funny reaction to the lidocaine but it was all fine. The next morning she was replying to me at 6am while I sent her videos showing it was fine! I also have a check up a month after it's done. The aftercare has been unfaultable, and really met my anxious needs! The next day - the bruising, swelling and scabs. All day, Sam kept saying "stop pouting!" as a "joke"
I was quite bruised and swollen for a day, but the Rimmel 16 hour lippe which Camilla recommended covered the marks perfectly. So here are the before and afters! As you'll see, my lips look the same shape and look like mine, but the wrinkles are pushed out and I feel normal. They're a little larger than they were before but I don't mind that! They also feel totally normal like my usual lips! Importantly, here's a side profile - no duck lip thankfully or shadow which looks like a moustache! That was something really important for me. The most important thing to me is that I feel confident finally. I've been wearing any lippie I want. I've been more mentally present in meetings and conversations because I know I look "normal" now. I'm really pleased I had them done. 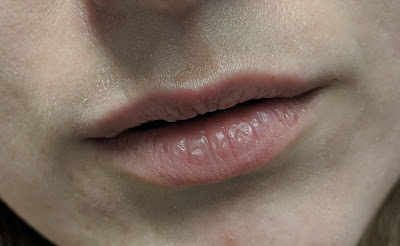 Another important thing for me is that I've seen most of my closest friends since I had it done, and my family and Sam's parents and nobody has said anything or spent time talking to my lips. Sam says it's a little like when someone looks a bit fresher or has a good hair day - something looks good but you can't put your finger on what it is. I've also noticed I've developed a habit of pushing my top lip out because it could hide some of the worst bits of my bottom lip. Now I can stop doing that!